It kind of just hit me hard that today, February 23rd 2013, Mano Erina has officially graduated from Hello! Project as their sole soloist. I know that I've told myself a million times it was happening this February, but even now after she has graduated, it still feels like it hasn't happened. 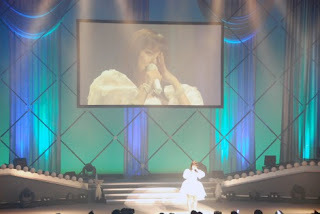 I think that when it came around, I just put it to the back of my mind because I didn't want to upset myself, but after seeing the article on Tokyohive and hearing that the last song she sang was My Days for You, I really can't say much other than that I had finally realised that this was it, the graduation of Mano Erina, her grand Finale as a member of Hello! Project... and to be honest, I did not expect reality to hit me so hard because no matter how much I love her, Mano is not my Oshimem. All I can say is that I feel like the Graduation itself was too sudden, too close to her improvement as a singer and performer. I wish she had stayed on a year longer, because there has already been so many departures already from great singers and performers in Hello! Project before her. I think that it's pretty overwhelming actually; so much has happened in the past 4/5 years in terms of graduations and change within Hello! Project, and Mano's departure only adds to that. I feel sad not only by this overwhelming amount of change, but also the loss of a great act within Hello! Project. That said, I am happy that Mano was able to graduate successfully and bring her fans a great, final performance as a soloist of Hello! Project. Hopefully those who joined her in her graduation treasured the moment and dedicated themselves fully to being her fans in her final performance. Now all we can do is hope for a great future for Mano Erina as an actress and wish her luck in her future endeavours. What a strange dress she graduated with O__O Anyways I wish her luck in the future! I don't know about it being too early for her to graduate. Her change to an actress (that's what she's doing right?) seems better for her to start now in my opinion. Mano's graduation hit me a lot harder than I expected, too. After spending some time looking at all of her singles, I can say that she grew tremendously as a performer and a singer. I'm happy to hear that she closed out her career with my favorite song. I have yet to see the concert for myself, so I wonder if I'll be able to hold it all together when she bows for the last time. It's sad to think that she won't be singing with H!P any more. I love her as a singer now (not so sure about earlier on really, the songs bored me) and she definitely grew and really became a mature and beautiful woman.